--Send SSL SMTP email silently from command line (CLI), or a batch file using Exchange, Gmail, Hotmail, Yahoo! Plus, or a custom server - for FREE! 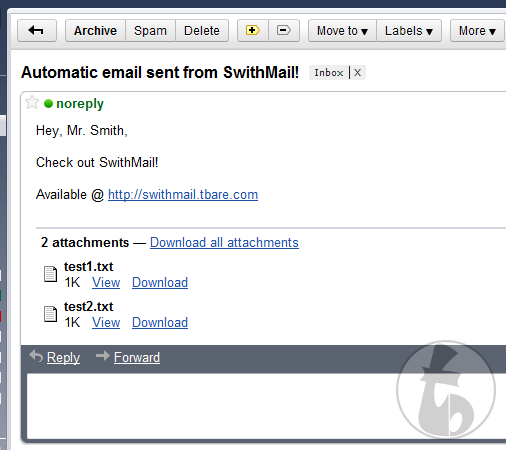 SwithMail is free for Commercial and Non-Commercial Use. That said, if you find it useful, please consider a donation. 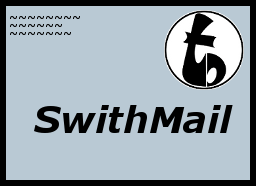 SwithMail is licensed under a Creative Commons Attribution-NoDerivs 3.0 Unported License. SwithMail is a windows application that is extremely easy to use. You run the program, set up basic settings (from address, to address, smtp server info, email subject and body), click save, and you're ready to go. Now you can send email using these settings silently from the command line, a batch file, or (the reason I wrote it), if a windows service quits. Trying to use Gmail, but getting a "5.5.1 Authentication Required" message? Google has security set up to disallow logging in from certain applications that they deem "Less Secure." To get around this, you can head over to https://www.google.com/settings/security/lesssecureapps and turn on access to less secure applications. Want to see some screen shots? 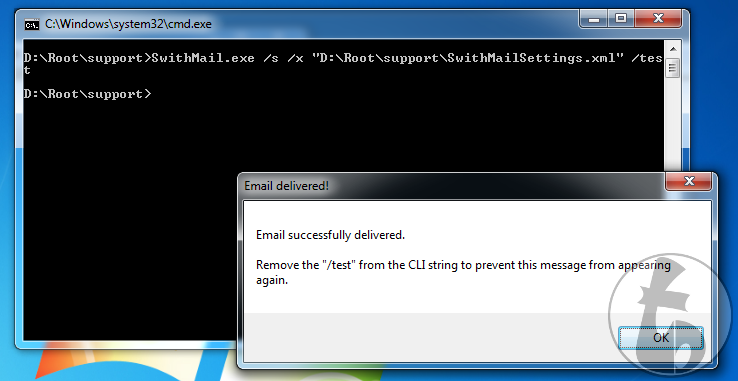 When running silently from command line (or more specifically a batch file), Swithmail now supports error codes. /Silent -- [also '/s' and '/q'] send an email without any prompt. /XML -- [also '/x'] "C:\PathToSettings.xml"
/Subject -- [also '/sub'] subject "in quotes"
/BodyTxt -- [also '/btxt'] full path of a text file to be used as the message body. /Log -- [also '/l'] Path to Log file with success and failures. Logs Date, ToAddress, and Subject. If no path is specified, the log file will be in the directory from where SwithMail is running. -arguments not specified will use option saved in settings"
line 2" /html /param1 "Mr. Smith"
Obviously, you wouldn't need to use %Param1% when you specify the subject and body from the CLI, but, again, if you need to send emails on a schedule to multiple different recipients, and you want to personalize them, open SwithMail without the /silent option, configure settings, and fill out the subject and body using %Param1% - %Param5%, then you can write a batch script, and specify the different "to" addresses, and the parameters, and have SwithMail do the rest! Others versions should work, but I have not tested them. If you try it, and it does work, let me know and I'll add it to the list. Thanks! -Minor Bug Fix - relabel "TSL" to "TLS" -- too many acronyms in my head. keeping "/tsl" argument for legacy support for people. -Minor Tweak - rearrange main window in GUI to make slightly smaller. -Bug Fix - "Reply-To" issue resolved. -Tweak - updated Donation link to "https://www.tbare.com/donate/prod=swithmail"
-Bug Fix - Resolve issue with Outlook replacing extension with ".dat"
-Enhancement / Bug Fix - Added fix for Wildcard attachments that doesn't ignore text before the asterisk. -Enhancement - Added alternate "plain text" view for HTML emails to help reduce SPAM score. -Enhancement - Added Support for wildcards on attachments ("c:\path\to\files\*.csv" will attach all .csv files in the folder -- NOTE: You must specify the file extension -- *. * will not work). -Enhancement - Added /BodyTxt (or /btxt) argument - specify a text file to be used as the message body. (%Param1% - %Param5% CAN be used in the text file and be replaced by arguments. -Removed Colon (:) and Equal sign (=) separator for CLI arguments - was causing issue when those characters were in the strings behind them. -Bug Fix - fixed /sub argument string changing to "true" when using the long CLI form. ** "Unlimited" means that SwithMail will try to deliver all attachments - email providers may have limits not enforced by SwithMail - If that limit is exceeded, emails may fail to send. Basically, I am not responsible for the way this application is used, nor can I ensure that no damage will be caused by using this program. Don't use it to send SPAM. Please... that's not why I wrote it, and nobody likes SPAM!